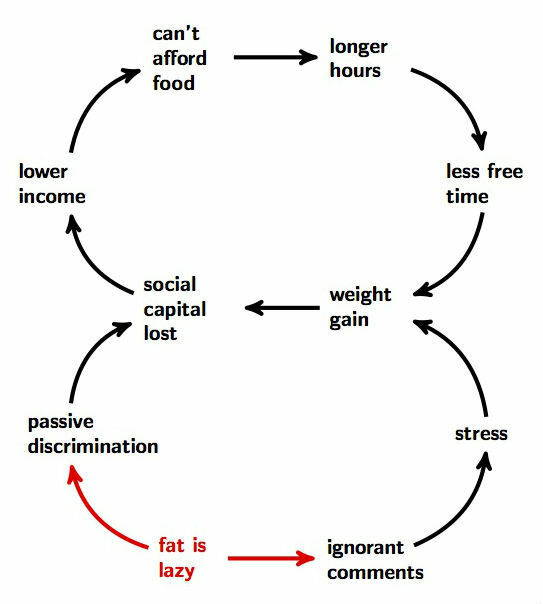 The systemic nature of obesity, and a few of its socio-economic feedback loops. As part of the systemic explorations of athleticism on this blog, it’s time to begin addressing the topic of obesity. Let me begin by stating that obesity is not, as many believe, a reflection of someone’s character, or caused (and maintained) by a lack of willpower. It is largely a systemic issue, meaning that in our current socioeconomic structure, there are a multitude of processes that contribute to the creation and proliferation of obesity in particular populations. In fact, the evidence that obesity is systemic begins with the fact that it is much rarer in affluent (white) populations than it is in minorities, the disenfranchised, and the oppressed. If it was an issue of willpower, then we’d see no such social, ethnic, and economic disparity between populations. As with all systems, society and the body both work in terms of feedback loops—processes that link with other processes in order to achieve a particular function. A typical example of a feedback loop is a thermostat: when the temperature in the room rises, the air conditioning kicks in. Once the temperature drops, the thermostat shuts down, allowing the temperature to rise again. One process (the rising temperature) “feeds back” into the other process (the thermostat/air conditioning), creating a loop. In order to diminish the expression of obesity in a population, the relevant feedback loops have to be understood. One such loop is created by the following factors. The high prices of unprocessed foods often make them prohibitively expensive to the poorest populations, who often have to work longer hours in order to make ends meet. With no time for visiting family, let alone constant, rigorous physical activity, people develop metabolic problems and gain weight. 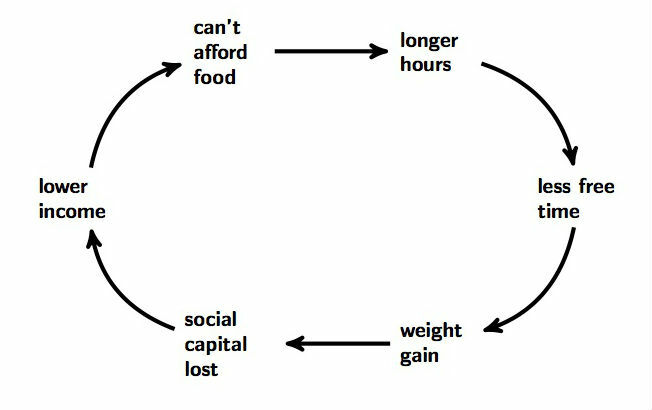 However, because obesity is perceived to be a product of laziness or poor character, the person often loses social capital. With this loss of social capital, the person loses job opportunities to slimmer, fitter individuals of “better character,” solidifying their poverty and destroying any possibility of change. There are other biological factors to be taken into account: because stress itself often leads to weight gain, the lack of free time for most working adults can also contribute to the expression of obesity. Social stresses, such as the pressure to exercise or diet, created by well-meaning yet ignorant people that are sure that all these people have to do is “go work out,” can not only destroy motivation but also directly increase someone’s weight gain. Try getting out of that system. And it’s only part of the story. Of course, none of this means that conceivably, obesity cannot be caused by a loss of willpower or poverty or character. But what the systemic analysis does is illustrate that overwhelmingly, the most powerful contributors to the obesity epidemic are not inside the person (whether they be genetic or psychological). They are outside, in the socioeconomic system, or created by outside forces inside the person. The last thing we should do to someone struggling with obesity—or someone who isn’t struggling and just wants us to get the hell off their back because they’re okay with themselves, or someone who in fact isn’t obese (or otherwise unhealthy) and just looks fat to our untrained eye—is suggest them to change or expect them to change. Perhaps the biggest social contributor to obesity is ignorance of systemic factors, and of systems in general. And it isn’t the ignorance of those who suffer from obesity, but the ignorance of those who don’t. For example, even though obesity is characterized by an increase in body fat, body fat alone does not signal obesity. This is a condition in which the person’s metabolism is working against itself, putting on too much fat to maintain health and mobility. Unless those conditions are met, body fat is just body fat. Unless we know that this “added” body fat is impinging on someone’s health to a certain degree, we can’t know that they are obese. Most of the time, people who look chubby are completely healthy. However, to those of us who have associated fat with obesity—and to those others who use a lack of body fat to gain social capital—this is a disagreeable state. But some differences really are only cosmetic. Ignorant, yet well-intentioned comments or suggestions will do a majority of people very little good. Often, all they really do is entrench our own ignorance (since we leave the interaction so smugly sure of our knowledge) and distance ourselves socially from the person we commented on. Casting attention on a feature that is socially disadvantageous (but not disadvantageous in terms of health) shines a light on how we don’t have that “problem,” whether we want to or not. Our social capital increases, whether we see this or not, and that benefits us, whether we understand that or not. Those actions only solidify the argument that because obesity creates body fat, body fat is obesity, and therefore fat is bad. Unsolicited advice has systemic repercussions. By itself, even if it’s accurate—or rather, especially if it’s accurate—unoslicited advice can worsen the problem. Something we could do is help remove the systemic factors contributing to obesity, including the social pressures to be thin. This is not to say that obesity is okay. Obesity is a metabolic disorder whose effects seriously encroach on people’s quality of life, particularly towards their senior years. We’ll never get around this fact. But just trying to help isn’t enough. The ignorance that leads to “helpful” comments and suggestions really only exacerbates the problem. The road to hell is paved with good intentions. Only in the case of obesity, it’s usually us paving the road, and it usually leads to somebody else’s hell.